Naomie Harris is an English actress best known for her lead role as Selena in 28 Days Later, her supporting role as Calypso in Pirates of the Caribbean two and three (I know… she cleaned up nice), and most recently Miss Moneypenny in the newest James Bond film, Skyfall. 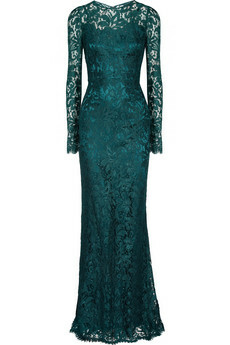 The $4675 lace gown she dons is by Dolce and Gabbana and can be found on here and here. One would die if given the opportunity to wear this dress. Why do you like it so much Brittany? Sometimes lace can go oh so very wrong when there’s too much going on, but this… this vintage and elegant work of art is an ode to class. The lace is obviously intricately crafted and modernized, it doesn’t look like my grandmother’s living room curtains. Secondly, I got a love way deep down in my heart for bold colours, I love bold, rich colours, and this my friends is bold and rich (I know, overkill, sorry). The dark toned teal is also perfect for the fall season. Though the gown looks lovely atop her bronze skin, my only wish is that the dress was lined with fabric the same colour as the dress. Lastly, Ms. Harris is working the hell out of this dress, the dress isn’t working her. Her confidence (peep the look on her face and the hands on waist) is what really drew me into the picture. Her makeup is flawless and her hair is laid for the gods. What more can one ask for? Many women have worn lace dresses, and many more will after Naomie, but none will look exactly like her. Hence, this look is BASS approved.